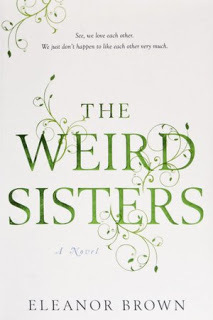 The Weird Sisters, sadly, irritated me enough from the beginning that I found myself just looking for things to be bothered by (and, as is almost always the case when you’re looking for flaws, they are to be found). I didn’t like the first person group point of view (“We were too easy on her, yes. . . “), I have deep distaste for books where affairs are a large part of the storyline, and I found all three sisters unlikeable. I found all the Shakespeare references to be a little pretentious. Sometimes, I’m just a big grumpus (as we call them in our house). The story is about three sisters (all named for Shakespeare women by their Shakespeare-obsessed professor father), all grown and now drawn back to their childhood home, ostensibly because of their mother’s recent cancer diagnosis, but really because they’re all freaking messes. Rose is engaged but can’t stand the thought of leaving her hometown, even though the opportunities for work for both her and the fiance are small, Bianca has fled the tiny college town for NYC which was all well and good until she started embezzling money from the small law office she works at and now has no references, no money, and also an enormous debt to settle (why they didn’t have her arrested is beyond me). And Cordelia has spent her life flitting from place to place, living on the road, and now is pregnant (and she’s not hundred percent sure, even, who the father is). Also, she has no money, no real skills, and no college degree. So, it’s not the worst book I’ve ever read. In fact, by the end, I felt like it had redeemed itself a little. I mean, not enough to recommend, but enough to not make me wish to throw the book across the room in disgust. Also, Merrick and Landen? I’m really glad we aren’t these kind of insane sisters (at least I don’t think we are). Hate every single thing about B. Hated the quotes, because sometimes they were just thrown in because one word in the quote referred to the situation, even if the whole quote didn't and then even the sisters were all, "Whaaa?" The thing with B and E was completely unnecessary. I kinda liked Cordy tho, I thought it was believeable that she was the baby and was just coming of age. I jut read Lisa's review at Books Lists Life and now yours and I feel sort of guilty for liking this one. Not my favorite, and I agree about the annoying POV, but I think it would be a title that would lend itself to plenty of discussion in a book club. Reading your review makes me want to rethink my position. Now that these flaws have been pointed out, would I pick it apart, too? HAHAHA – I just finished this book and liked it. Didn't love it, not my favorite book ever, but good. I kind of liked the sisters, though they did each have flaws. But I felt like they were trying to work on their flaws, trying to improve. I always like to see that in a character. I have a friend at work who whined to me about this book. It isn't going on my list. Anyway…this book is on my list–based solely on the description. But, after reading your review, I'm going to remove it. It doesn't sound like one I want to spend my time on.